Drawing A Blank: The Art of Cody Schibi: It's time to AnnhilEIGHT! …not only am I super excited that I somehow survived another year, but when January comes along I'm super DUPER excited because that means my favorite art show EVER is about to happen. No…not Bob Ross's Happy New Year's Special, but the anniversary show of ARTSLAM! & THIS year they're celebrating year EIGHT….AnnihilEIGHT!!!!! 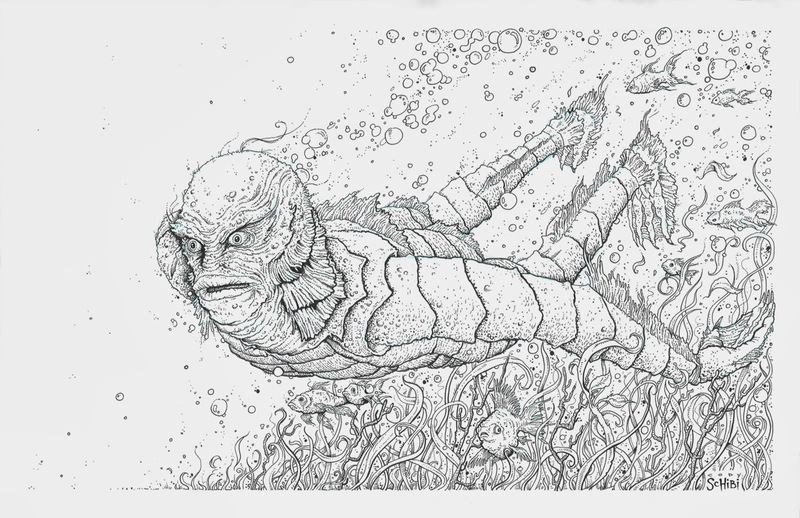 …this 17"x 11" guy really, really wants to swim into your hearts, so splash on by my table & pick one up! I'll have them available in my online store shortly after the show for those who can't make it. Coolio then, please check back as I'll finally have a wrap up of last year & what I have planned for this year. Oh YEAH!…a few weeks back the amazing folks at JUXTAPOZ surprised me with yet another small feature on me. This is my third writeup from them & I STILL feel extremely excited & grateful when they take the time to showcase my work. CHECK IT OUT HERE! Soooooo…see you ALL at ARTSLAM! 's Eight Year Anniversary event then?!? !